Below are links to the State Controller's Office Local Government Compensation Report. El Dorado Hills Fire Department is currently accepting applications for the position of Deputy Chief, Operations. The final filing date for this position is Thursday, May 23, 2019 at 4 p.m.
El Dorado Hills Fire Department is currently accepting applications for Firefighter Intern. Applications must be submitted by May 1, 2019 by 5pm to 1050 Wilson Blvd., El Dorado Hills, CA. This is a temporary, unpaid, non-benefited position. The Special Meeting on 3/14/19 has been CANCELLED! 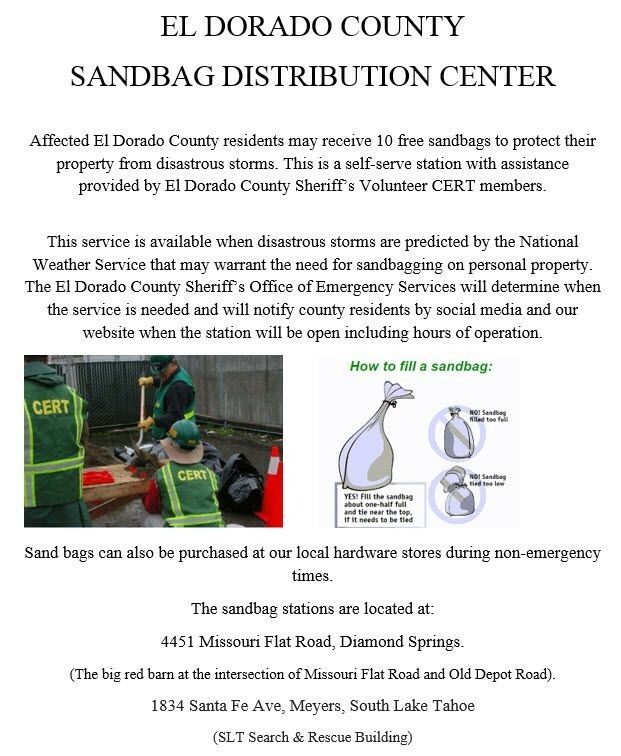 There are new locations where affected El Dorado County residents can pick up sandbags to protect their property from disastrous storms. El Dorado County Environmental Management has cancelled the Household Hazardous Waste collection at the Bass Lake Road Fire Station for March 2, 2019. For future HHW collection site status, please call the hotline at (530) 295-4100. For a list of items that can be dropped off, please see our HHW page. El Dorado County Environmental Management has cancelled the Household Hazardous Waste collection at the Bass Lake Road Fire Station for February 16, 2019. For future HHW collection site status, please call the hotline at (530) 295-4100. For a list of items that can be dropped off, please see our HHW page. El Dorado Hills Firefighters' Association is now accepting scholarship applications for 2019. The eligibility list and application can be found on the Scholarship webpage. The application deadline is Friday, April 12, 2019 @ 4:00 p.m. Your questions can be directed to Christina Burroughs at (916) 933-6623 ext. 1010 or via email. El Dorado County Environmental Management has cancelled the Household Hazardous Waste collection at the Bass Lake Road Fire Station for January 19, 2019. For future HHW collection site status, please call the hotline at (530) 295-4100. For a list of items that can be dropped off, please see our HHW page. Notice is hereby given that one vacancy exists on the El Dorado Hills County Water District (Fire Department) Board of Directors. A Letter of Qualification or Resume must be submitted to the District Office at 1050 Wilson Blvd, El Dorado Hills, prior to Wednesday, January 16, 2019 at 4:00 p.m.to be considered for appointment. For more information, view Board Vacancy Notice. 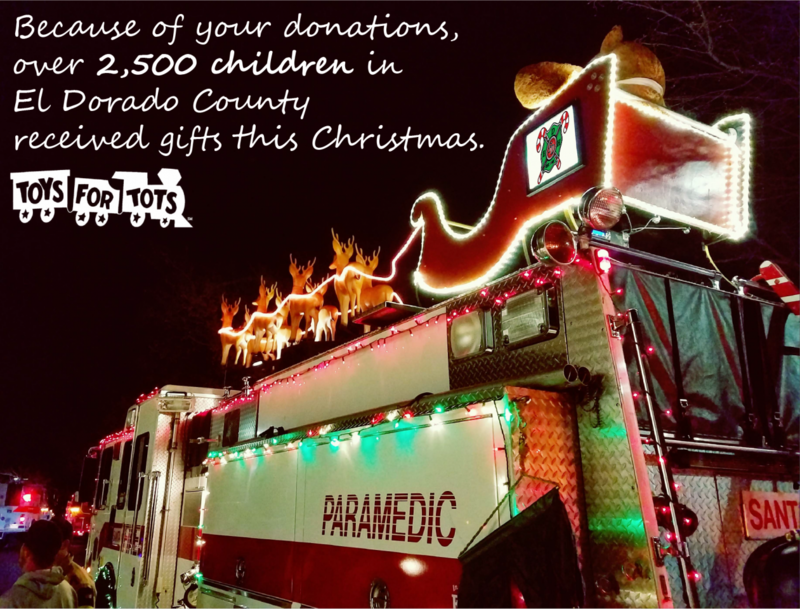 Toys for Tots was a Success! El Dorado County Environmental Management has cancelled the Household Hazardous Waste collection at the Bass Lake Road Fire Station for December 1, 2018. For future HHW collection site status, please call the hotline at (530) 295-4100. For a list of items that can be dropped off, please see our HHW page.